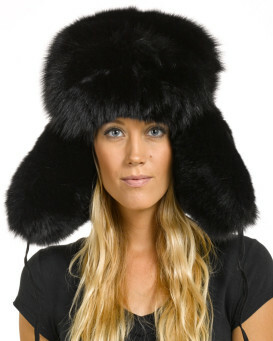 If you are looking for a fabulous hat made from genuine fox fur, you are in the right place. 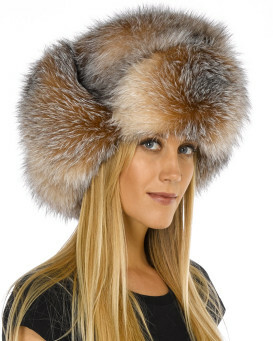 Our selection of fox fur hats is extensive, offering you a range of styles to choose from. 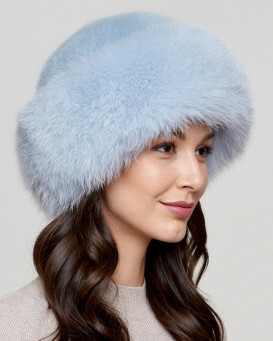 We have the lovely Zhivago hat, inspired by the 1965 film Dr. Zhivago, available in black, natural blue, crystal, and silver indigo fox fur. The interior of the hat is lined with soft satin for a comfortable fit no matter how long you're wearing it. Then there are our roller hats, available in multiple styles. 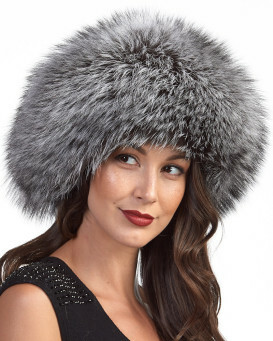 Both the fox fur and leather roller hats and the fox fur and mink roller hats are available in black, white, crystal, and silver. 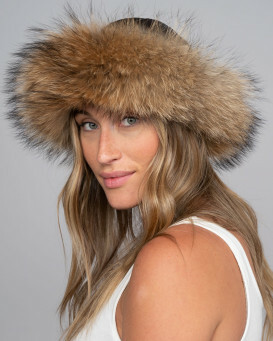 We have fox fur cuff hats with felt or wool crowns, and a raccoon fur cuff hat as well. 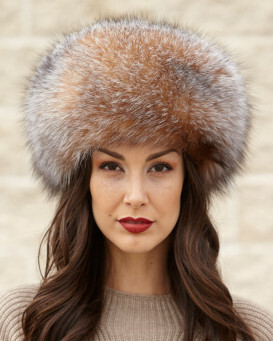 Our selection of knit fox fur hats come in classically inspired colors: black, black frost, brown frost, and white. For those looking for a little sass, our modern and playfully styled knit fox fur bonnets with pom poms are available in the same colors. All of these hats feature fine construction and are only made of top quality materials. 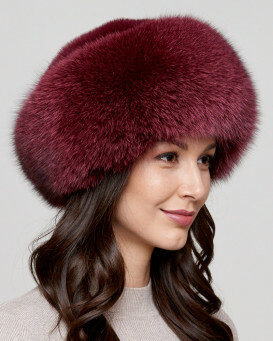 Fur is a naturally durable material, and with such excellent craftsmanship the hat you choose is sure to be a part of your wardrobe for years to come. 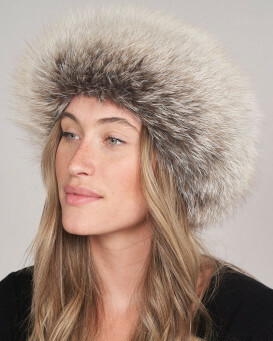 Each hat is amazingly cozy as well as being stylish. 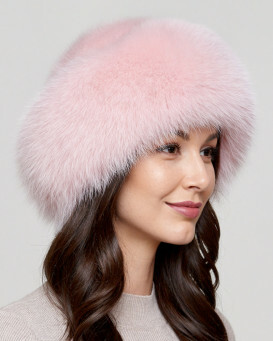 No matter whether your primary concern is keeping yourself comfortable, staying warm, or looking great, you will doubtless enjoy whichever hat you choose to purchase. 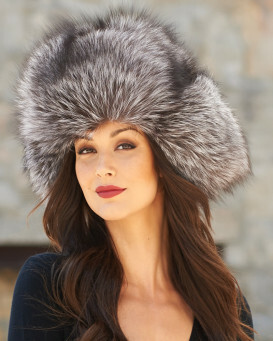 Most of our line of fox fur hats are proudly made in Canada or America. 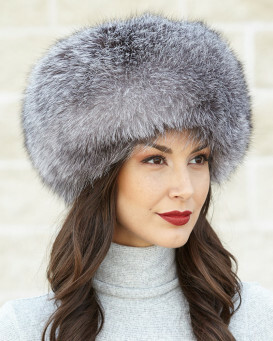 These pieces of North American head wear are all Origin Assured, meaning you can be sure that the materials for each item have been acquired from regulated and legal sources. "Love this hat! its absolutely gorgeous and feels fabulous on! (frost) color is superb. Love that it's knit so stretches over my hair clip if i choose to wear with my hair up. Love, Love, Love it! super soft, not itchy on my head - fabulous!!" "I absolutely love this hat. It is beautiful! My husband ordered it for me for Christmas and it arrived and he had me try it on to be sure it fits, which it did, perfectly. But now he has put it away until Christmas Day and I can't wait to open it! 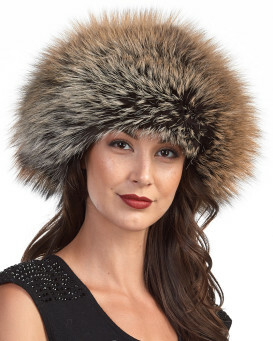 I don't even normally wear a hat, but this one is so gorgeous I will be wearing it every day, all winter long!" "Like others, I wish the clasp was a little higher to make the fit a little snugger, but by far one of my favorites. Do not be fooled with how light this is, it keeps you warm! I was a little worried it would not look as good as the models, but it did not disappoint. I get numerous compliments on this piece. I love furhatworld and will keep coming back! Excellent service and high quality product." "This hat is absolutely ADORABLE! 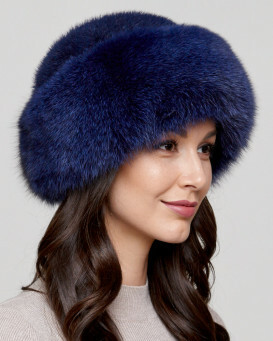 Very warm, excellent quality, and I feel as if I were Lara in Doctor Zhivago!!! Delivery was very prompt, and they even remembered to not show it came from "Furhatworld" on the box as I requested, since it also contained my husband's Christmas present!... which he is going to be soooo surprised!!! Thank you!" "Great product I love it, my husband get me for b-day, it is phenomenal, better that on picture, if anyone looking for great heat, get this one, you will not regret"
Based on 613 customer reviews.